After two weekends of long runs in Central Park I rewarded my legs with a long run on a semi-flat course along the Hudson River. Many, many years ago when I first started making regular visits to Christopher Street hanging out along the piers of the Hudson River was not one of the wisest things to do. Thankfully the City decided to rebuild this area and turn them into nice green spaces with some awesome running and cycling paths. These areas just happen to be my favorite routes to do any long run over 10 miles. Some days I’ll head uptown going towards the George Washington Bridge and others I’ll head downtown towards Battery Park. This year I’ve headed mostly downtown for reasons I think I’ve finally figured out. During the past year I sort of lost my running mojo. I was running races but I was barely putting the work in to race them. I just simply wasn’t finding the peace that running gave me. Right before the Napa to Sonoma Half Marathon I decided to that things had to change and this refocusing of efforts took place in a hotel room in Napa. But as I kept training I kept doubting whether or not this year’s NYC Marathon was a good idea. But then I did a long run along the Hudson and everything clicked and fell into place. I haven’t had a bad run since even when I did have a bad run. OK, that requires some explanation. This weekend, this OCTOBER weekend, had temperatures in the 70s and 80s. My legs were a little tight from my nine mile run on Wednesday, I forgot to put on sun block and Body Glide, and got off to a later start. It was a painful run and rarely did I feel comfortable. I couldn’t finish this 16 miles soon enough. When I checked my Garmin and compared it to my other long runs my pace was right on target. So while this run hurt and things were out of sync and by all accounts a bad run, it was still pretty good. 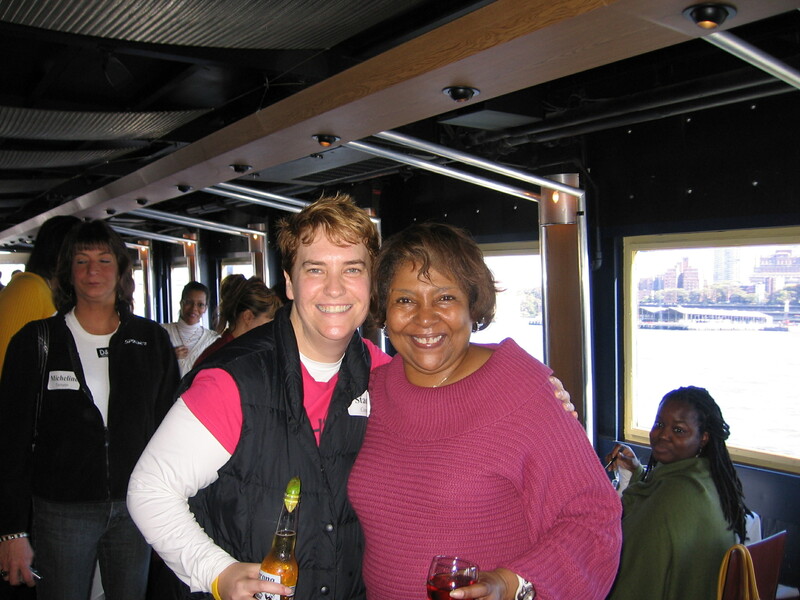 Here I am with Pearl on a company boat cruise around lower Manhattan. The woman standing behind us also died this past summer -- it's not right. One of my theories for this is my friend Pearl, who died unexpectedly two summers ago. I still miss her terribly and think about her often. Pearl lived in Battery Park City and whenever I head downtown on a run I always think about her. I see her smile, hear her laugh, and feel her warmth. Interestingly, it has been when I approach Battery Park City, in particular South Cove Park, that I have been having some pretty great runner’s highs. I know Pearl is still helping me. South Cove Park is one of the hidden gems of this city. It is one of the most peaceful and beautiful parks in the city. It has also become the place where I say my little prayer to Pearl on these runs. It doesn’t make sad but makes me happy and when I exit the park and look out the water I smile and know that Pearl is helping me along. I’m hoping she’ll keep giving me the little extra push for that really big 26.2 long run in November. This entry was posted in NYC Marathon, running and tagged Battery Park City, Hudson River, Napa to Sonoma Half Marathon, NYC Marathon, Running, South Cove Park. Bookmark the permalink.